The median price of an existing home in San Jose, Calif., was $980,000. Home prices are soaring across the country, increasing in 93% of markets in the U.S., according to the National Association of Realtors, with 19% experiencing double-digit growth. Nationwide, the median existing home price rose to $229,400 in the second quarter, up 8.2% from last year. But tell that to the people who live in northern California. The San Jose, Calif., metro area -- which includes Silicon Valley -- is the most expensive with a median home price of $980,000. 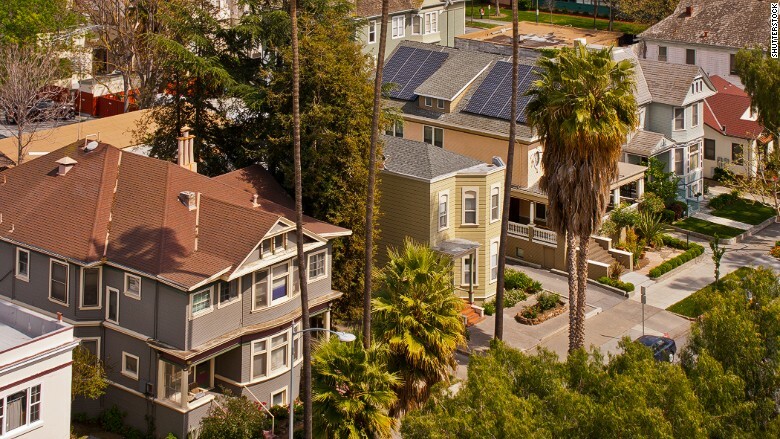 The Golden State is home to four out of the five most expensive housing markets in the nation. A number of factors are propping up home prices, including rising rents and more economic confidence. But lack of inventory remains the biggest accelerator. "If supply were plentiful, prices wouldn't be rising as quickly in spite of jobs and rents rising," said Danielle Hale, director of housing statistics at the National Association of Realtors. "The supply is really the clinching factor." While home prices have recovered, sales remain a drag. "New construction is needed, particularly at the low and middle end," said Hale. First-time buyers have been creeping back into the market, making up 30% of buyers in June, she added. Rising home prices are good news for owners gaining equity and sellers, but they can hurt affordability. According to the NAR, to buy a $229,400 home with a 20% down payment a buyer would need an income of $41,427.